Kay Sprinkel Grace, CFRE, is an internationally acclaimed independent consultant, speaker, facilitator, and writer. She has also been a core faculty member of the Fund Raising School since 1980. After successful careers in journalism and education, she became a development professional in 1979, working in several organizations before starting her own consulting firm in 1987. Since then, she has worked as trainer or consultant with thousands of nonprofit volunteers and professionals in the areas of board and staff leadership, planning, and capital and annual fundraising. Her over 40 years as a volunteer, principally for Stanford University where she received her BA and MA degrees and where she has been honored for her fundraising leadership, add perspective to this book. She is the author of Beyond Fund-Raising and the coauthor of High-Impact Philanthropy. Alan L. Wendroff, CFRE, is a nationally recognized consultant, speaker, and writer for nonprofit organizations. He has worked as a senior development professional with a national human relations agency. He writes and teaches online and classroom courses for the continuing education Nonprofit Management Program at California State University, Hayward. 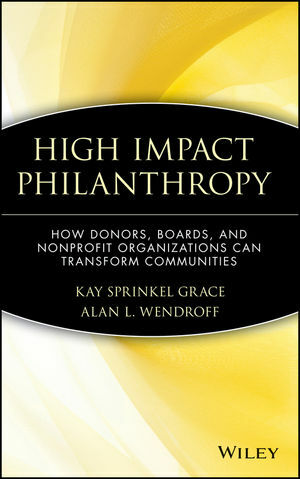 He is the author of the first edition of Special Events: Proven Strategies for Nonprofit Fundraising, and coauthor with Kay Sprinkel Grace, of High Impact Philanthropy: How Donors, Boards, and Nonprofit Organizations Can Transform Communities, both from Wiley. THE NEW PHILANTROPY AND ITS IMPACT ON THE MAJOR GIFTS CULTURE. The New Organization: Redefining Major Gifts. The Role of Major Gifts in the Overall Development Plan: Enhancing the Mission. Recruiting Donor-Investors for a Major Gifts Culture in Nonprofit Organization. Getting the Organization Behind the Transformational Giving Plan: Making the Case for Major Gifts. Major Donor Motivation: The Key to Transformational Giving. The Impact of Major Gifts on Organizations and Communities. The New Major Donors: Who They Are and What They Are Looking For. Asking for Major Gifts: The Role of Board and Staff Members. Getting Your Share: How to Market Your Values to the Community. Maintaining Your Major Donors: Critical Stewardship Practices. New Strategies: Evaluating the Impact of Philanthropy. Appendix A: High Impact Philantropy Timetable (HIPT).